Tilly and the Buttons: Introducing the Marigold Sewing Pattern! 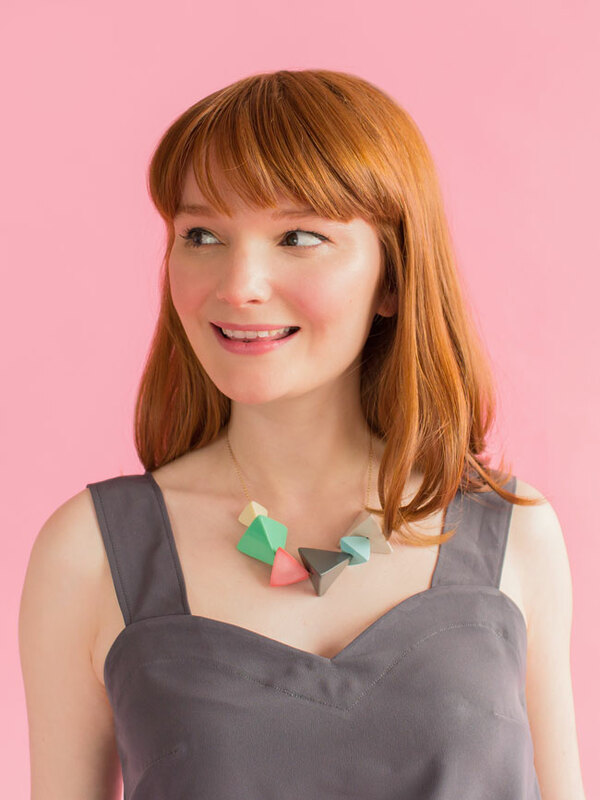 We are sooooo excited to introduce you to our latest sewing pattern! 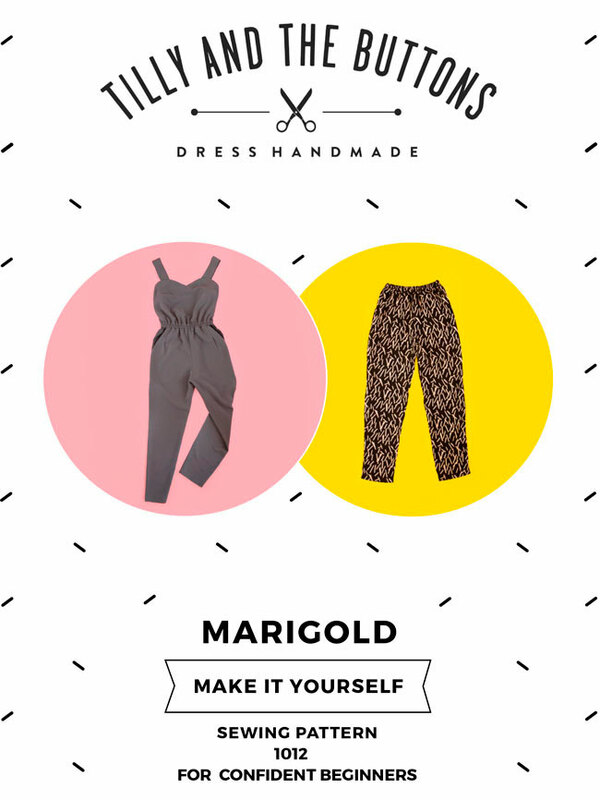 Marigold features two Summer essentials in one pattern – whip up a stylish jumpsuit or casual trousers, destined to become your go-to outfits! Throw on the super comfy Marigold jumpsuit with sandals or plimsolls for a picnic in the park, or with heels and a statement necklace for bossing it at the office or a night out on the town. The jumpsuit also looks great layered over tops, so can carry you through to the milder months. Wear the trousers with a casual t-shirt for chillaxercising at home or dress them up with a silky camisole for going out. This is one of those favourite outfits that make you look put together yet feel as comfy as if you’re wearing your PJs! I’ve just got back from a trip and can testify that these are perfect plane travel trousers. I’ve also been wearing them to the office non-stop! 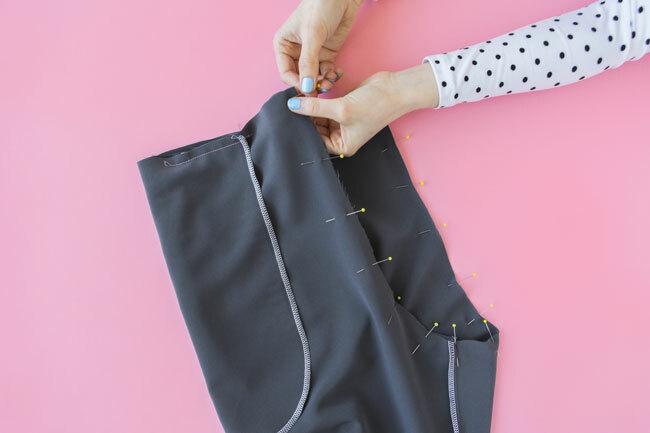 The trousers are super quick to make, and the relaxed shape makes them easier than most trousers to fit to your body type. They are peg-shaped - easy-fitting at the hip, tapering into a slim line ankle. The waist has gentle shaping from pleats and darts, cinched in with a quick-sew elasticated waistband. And let’s not forget the all-essential slash pockets for nonchalant slouching! If you’re making the jumpsuit version, the bodice is shaped with bust darts and a sweetheart neckline, with a comfortable blousy waist. It has wide (bra-concealing!) shoulder straps, and closes with an invisible zip at the side. 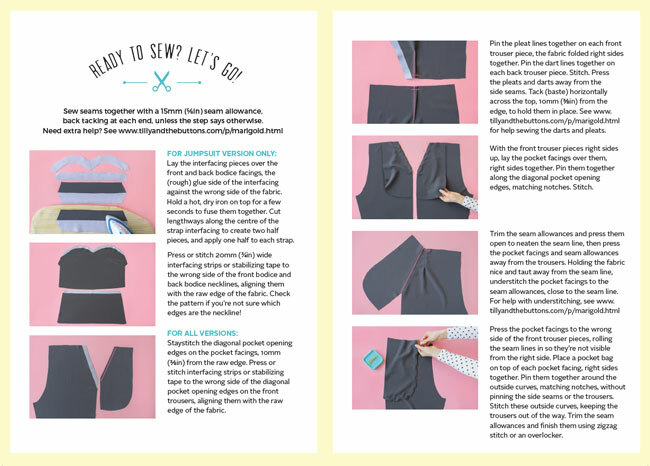 Like all Tilly and the Buttons sewing patterns, Marigold comes with jargon-busting instructions, packed full of sewing tips and photos demonstrating each step. 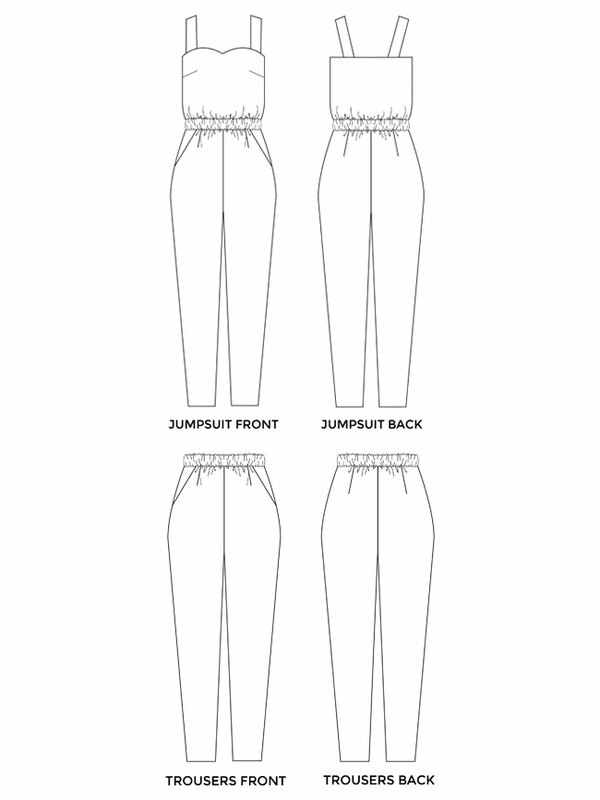 The pattern includes eight sizes, similar to UK 6 – 20 - you can see the measurements on the sizing chart. Order the printed pattern and we'll send you a gorgeous package in the post, with full size pattern sheets on reusable paper (not scrunchy tissue) and full colour booklet. We ship around the world. If you prefer the digital version, we'll email you instantly with a PDF pattern to print and stick together at home. We suggest you sew your Marigolds in light- to medium-weight drapey fabrics, such as viscose (rayon), silk or poly crêpe de chine, or lighter weight chambray. The trousers could also be made in a lightweight low stretch jersey. Drape is key – avoid crisp fabrics such as cotton lawn, and definitely don’t use anything thick like sweatshirt fabric (trust me, I tried it and it wasn’t pretty!). Check how much fabric and other supplies you need. We’ve labelled Marigold as suitable for ‘confident beginners’. All in all, it’s a pretty straightforward make. The hardest parts are potentially altering the trouser shape if you need to (as I said, they are relatively easy to fit for trousers - yay! ), and inserting the zip into the jumpsuit. Fri 17 June - Design hack ideas - we have lots of them! Wed 27 July – Your makes! The sewalong will stay up on the blog on the Marigold page, so you can catch up at a later date if you prefer. We hope you are as excited about Marigold as we are! Can’t WAIT to see what you make. Share your fabric choices, works in progress and finished makes on Instagram using the hashtag #SewingMarigold so we can see! Photographer: Fanni Williams / Hair and make up: Katie for Natalie Guest / Model: Rosabella Riddington – check out her inspiring sewing blog!